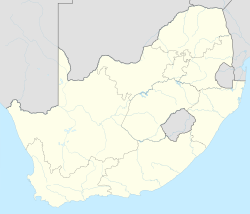 Leandra is a town in Gert Sibande District Municipality in the Mpumalanga province of South Africa. Town some 45 km east-south-east of Springs, comprising the former towns of Eendrag and Leslie. The name is a combination of Leslie and Eendrag. ^ a b c d "Main Place Leandra". Census 2011. ^ "Dictionary of Southern African Place Names (Public Domain)". Human Science Research Council. p. 273.